For a complete analysis of this new camera, click here. For some video reviews, click here. To see sample images and videos from Canon Japan, click here. I am off on a wildlife photo shoot in South Africa. Little time to update my blog. Will reconnect upon my return. 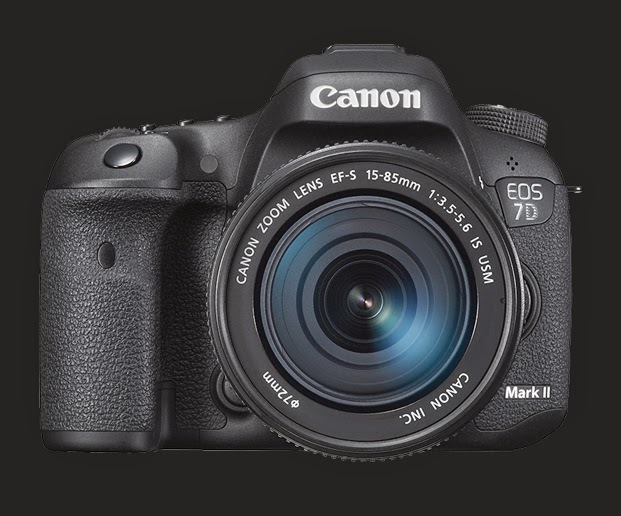 MELVILLE, N.Y., September 15, 2014 - Canon U.S.A., Inc., a leader in digital imaging solutions, is proud to introduce the EOS 7D Mark II Digital SLR camera, incorporating professional features and quality in an affordable DSLR. Building upon the proven success of the EOS 7D camera, this new EOS model features a range of “EOS firsts” such as Dual DIGIC 6 Image Processors for superb image quality and rapid burst shooting up to 10 frames per second (fps), as well as Canon’s first 65-Point* All Cross Type autofocus (AF) system for compositional freedom and accurate, spot-on fast focus. Great for shooting indoor activities such as sporting events, concerts, or weddings, the camera’s impressive low-light shooting capabilities along with its up-to-10 fps high-speed shooting can capture a fast-break basketball dunk, a band’s encore performance, a bird in flight or wildlife in exceptional quality. In addition, the EOS 7D Mark II is the second EOS DSLR camera to incorporate Canon’s innovative Dual Pixel CMOS AF system for rapid and precise focusing of video as well as still images. The EOS 7D Mark II features Canon’s revolutionary Dual Pixel CMOS AF, a milestone in AF speed and accuracy that unlocks the potential of Live View shooting. This advanced technology has truly changed what is possible with a DSLR camera. Dual Pixel CMOS AF involves a sophisticated rethinking of the CMOS sensor. Traditionally, image sensors have one photodiode per pixel for recording, but the CMOS sensor on the EOS 7D Mark II has two photodiodes per pixel, 40 million in total, enabling each pixel on the sensor to both perform phase-difference detection autofocus and capture light. With phase-difference detection AF, autofocus is achieved quickly and easily on the camera. This unique AF system enables autofocus on approximately 80% of the image plane, vertically and horizontally, and helps ensure virtually no loss in image quality. You can place your pre-order at your favorite camera stores now. I will not be posting links to any stores since I am completely unbiased and do not accept commission from any company. Great value for the money. Many top-of-the-line features for a moderate price. I can smell a winner already. I am sure you'll agree.